The measure quickly drew a legal challenge. The ACLU and other groups say federal law allows anyone on U.S. soil to petition for asylum, even if that person crossed the border illegally. They filed suit Friday morning in a federal court in San Francisco. "President Trump's new asylum ban is illegal," said Omar Jadwat, director of the ACLU's Immigrants' Rights Project in a statement. "Neither the president nor his cabinet secretaries can override the clear commands of U.S. law, but that's exactly what they're trying to do." "The fact that the ACLU and its partners would go to court to specifically sue for the right for aliens to enter the country illegally is demonstrative of the open border community's disdain for our nation's laws that almost all rational Americans find appalling." The administration wants to get around the asylum provision in U.S. immigration law by using the president's broad authority to exclude any immigrant — or class of immigrants — deemed "detrimental to the interests of the United States." That's the same authority the president used when he issued his travel ban on a variety of mostly Muslim countries. That ban was initially blocked by the courts but after several revisions was ultimately upheld by the U.S. Supreme Court. 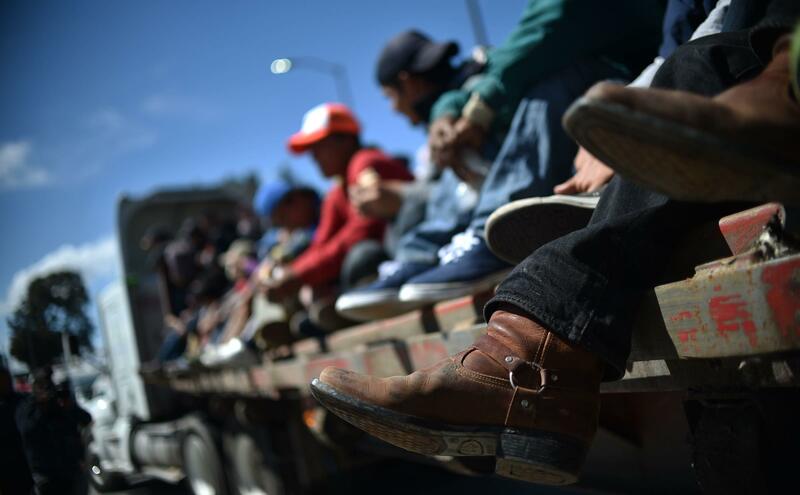 The Trump administration is taking steps to stem the flow of Central American migrants crossing the U.S.-Mexico border. Today the Justice Department and the Department of Homeland Security issued a new rule. It's designed to prohibit migrants who cross the border outside of designated entry points from seeking asylum once they reach the United States. The administration complains many migrants are abusing the asylum system and placing a tremendous burden on the federal government. NPR's Scott Horsley joins us now from the White House. Hey, Scott. CHANG: So the president's been issuing, you know, dire warnings for weeks now about a caravan of migrants from Central America slowly making its way through Mexico towards the U.S. Is that who this rule change is aimed at? HORSLEY: Well, certainly the caravan became a boogeyman for the president in the final weeks of the midterm campaign. But more broadly, illegal immigration has been a target for Donald Trump ever since he launched his bid for the White House three years ago. Even though overall illegal immigration numbers are way below what they were in the late '90s and the early 2000s, President Trump is very unhappy with the spike we've seen in children and families from Central America. For a variety of legal reasons, they are much harder to expel than the single adults from Mexico who made up the bulk of illegal border crossers a generation ago. A lot of the Central Americans claim when they arrive in the U.S. that they are afraid of persecution if sent home. And even though the administration says a lot of those asylum claims turn out to be unfounded, the migrants get to stay in the U.S. in the meantime. And that's a headache for the White House. CHANG: OK, so what exactly would this new regulation do? HORSLEY: Basically, it would say if you cross the border illegally, you are no longer eligible to seek asylum. The goal is to funnel asylum-seekers to official ports of entry only. Now, the administration says that's where they have the manpower and other resources to process those asylum claims efficiently. It's also possible, though, that this would by design create a kind of bottleneck and simply choke off the flow of migrants in the hopes that eventually they would give up and stop trying to get to the U.S.
CHANG: And before, just to be clear, you could seek asylum no matter where you entered the border, right? HORSLEY: ...Of his administration. You'll remember, Ailsa, that ban was initially blocked by the federal courts. But after a couple of revisions, it was ultimately upheld by the U.S. Supreme Court. So now we have two provisions here that seem to be in conflict. Ultimately, immigration advocates are likely to challenge this move by the administration. And then the courts are going to have to sort it out. 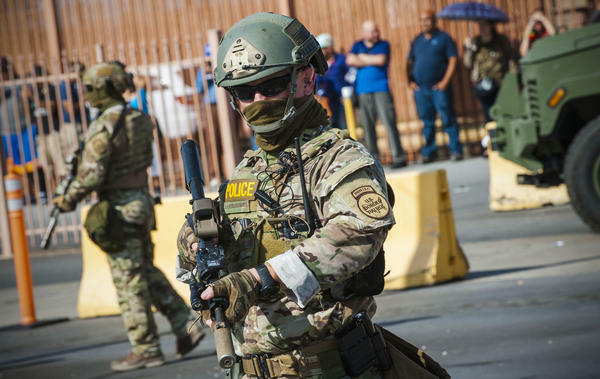 In the meantime, you've got the president ordering thousands of active-duty military troops to the border to back up border officers. And Trump has also talked about erecting tent cities where he could detain immigrant families for an indefinite period of time. CHANG: That's NPR's Scott Horsley at the White House. Thanks so much, Scott.